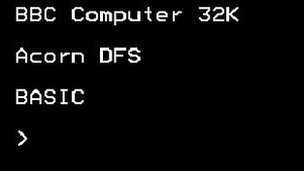 In the 1980's at primary school we saw MS DOS and DR DOS competing before Windows 3.1 and subsequent releases took over that space. At home we had Apple II's which booted up to a BASIC prompt. On these we ran PRO-DOS and CP/M. 30 years later my kids hardly know what a disk is. That made me think "Why was it called a 'disk' operating system? Was it to contrast it with a 'ROM' based operating system? (You never really heard of a 'ROS'). My question is: Does "Disk Operating System" imply that there was a "non-disk" Operating System? The term "Disk Operating System", or commonly "DOS", was used in the early days of personal computing to distinguish operating systems that also contained software for supporting disk devices, since not all of them did. The DOS software could access blocks stored on disk, that were organized into files, and there was "filesystem" software included for managing the collection of files on the disk. The term does not imply that the DOS software itself had to be loaded from disk. Several popular systems included the DOS software in ROM in the microcomputer, or even in the disk drive itself, as was the case with Commodore disk drives and CBM DOS. Other DOS software, like ProDOS and MS-DOS, did load from disk. So, yes, operating systems lacking software support for disk devices would be called simply "OS" and not "DOS". It doesn't imply that it's the disk operating system so much as it implies that it's the disk-operating system. You could boot an Apple II from ROM, enter and run BASIC programs, load programs from cassette, and basically do whatever an Apple II can do, but there was no way to access files on disk. Apple DOS didn't really do any of the features of a modern "operating system" (which were either built into ROM or entirely nonexistent), but what it did do was provide the routines for accessing disk files and directories, thus disk operating system. The same can be said of Atari DOS, CBM DOS, TRSDOS, etc. Although MS-DOS isn't entirely the same, to some extent it is. The earliest IBM PCs did come with BASIC in ROM (called "IBM Personal Computer Basic" on the copyright screen, but commonly known as "Cassette Basic" to differentiate it from "Disk BASIC" which ran on DOS), and the BIOS ROM provided the basic facilities of keyboard, screen, printer, etc. So the most important service that MS-DOS added to that was the ability to read and write files from disk, and execute programs on disk. It also added a command shell (COMMAND.COM) that was the most common way of interacting with the computer, rather than BASIC. When later PC models eliminated ROM BASIC, DOS became pretty much the only way to boot and use the machine at all (unlike most other 8-bit machines). The term DOS pre-dates the personal computer by a looong way: the term DOS/360 was first coined by IBM in 1964 as a new operating system for their System/360 mainframe computers, to replace TOS (tape operating system). IBM commissioned Microsoft (at that time a garage outfit) to write PC-DOS to run on their Personal Computer, which was launched in 1981. Somehow, IBM allowed Microsoft to keep the rights to the operating system, and they started selling their own version as MS-DOS. As the IBM PC manual included a complete set of circuit diagrams, there were very soon a lot of PC-clones running MS-DOS. The rest is his history. Microsoft didn't actually write PC-DOS: they ported something that Tim Paterson at Seattle Computer Products had put together in six weeks. Tim's working title for the project was QDOS (Quick and Dirty Operating System). Does "Disk Operating System" imply that there was a "non-disk" Operating System? The earliest computers did not even have Operating Systems. The earliest computers were mainframes that lacked any form of operating system. Each user had sole use of the machine for a scheduled period of time and would arrive at the computer with program and data, often on punched paper cards and magnetic or paper tape. The program would be loaded into the machine, and the machine would be set to work until the program completed or crashed. Programs could generally be debugged via a control panel using dials, toggle switches and panel lights. In 1953, IBM recognized the immediate application for what it termed a "Random Access File" having high capacity and rapid random access at a relatively low cost. After considering technologies such as wire matrices, rod arrays, drums, drum arrays, etc.,the engineers at IBM's San Jose California laboratory invented the hard disk drive. In the personal/home computer space, the usual model was that the machine shipped with built in BASIC and the ability to save and load data from an attached cassette tape. This includes the original IBM PC, which had BASIC in ROM, as well as a specific cassette port that included a relay for controlling the cassette motor. BASIC itself included a MOTOR command for controlling this relay, and enterprising hardware hackers could use this port to control things besides cassette motors. In these early systems, the OS was effectively the BASIC interpreter. From here, the PC quickly diverged from other small computers. For an Apple ][, DOS was mainly the disk drive support software and some additional commands for the BASIC interpreter. A BASIC REPL (Read-Evaluate-Print loop) therefore served as what'd we'd consider today to be a terminal or command window, and BASIC maintained primacy over the system unless it was replaced by something that it loaded. So the tl;dr is that non-disk operating systems tended to be BASIC interpreters that allowed mass storage only via tapes. Much of this was true in the mainframe and minicomputer space as well. Tapes predated disks, so pre-disk operating systems all tended to be tape based. Small single-user computers were typically a single task. They also had limited memory, so the most that their operating systems could do was manage I/O. As most of their function was dedicated to disk filing and maybe a little terminal/printer I/O, they were primarily disk operating systems. Large computer systems, on the other hand, had functions to manage multiple users, perform memory management, job accounting and network functions. Disk I/O was a relatively small and low-level part of their operating systems. Consequently, a DOS was a minimal shell over the small machine's hardware I/O, whereas a full OS was much larger and abstracted away from hardware. I think it is fair to say that Disk Operating System implies an OS that talks to disk in the commonly perceived environment of files, file sizes, directory(ies), time stamps, open(), close(), read(), write(), etc. Operating System is neutral on the subject of whether or not there is a disk. Many might group them with devices that have no large, native storage, such as many classic PDAs, or that used cassette as the primary storage medium. As the question implied, we have sort of moved beyond the idea of DOS. Yes, Windows, OS X, and Linux can all talk to disk (HDD and/or SSD), but in the networked world, that is a feature we no longer really think about. But something else exists. Classic FORTH broke all the perceived rules. Most implementations had access to disk. But no one referred to it as a DOS. Heck, most people would not even recognize it as an OS, even if it allowed a full, interactive, multi-user, (co-operative) multi-tasking environment in 64 kbytes of RAM with an 8-bit processor. Even if the OS was indistinguishable from the language. Or the application(s). Or the development environment. You had the hardware and you had FORTH, and that's all there was. If you were operating single-user, you had 100% control of everything, all the time. BLOCK (n .. addr): given the block number n, read it into memory (if not already present in one of the available buffers) and return the address of the first byte. There were other words too, both higher and lower level, but those were at the heart of this operating system thingy that talked to disks. I'll add that most modern FORTHs cast away their operating system nature and operate as simply one application among many under the "real" OS. "In the 1980's at primary school we saw MS DOS and DR DOS" -- in the '80's? Hah! Youngling! Before DOS there was TOS -- the Tape Operating System. You would mount a substantial looking tape on a tape drive the size of a refrigerator, select it as the boot device using dial switches, and press the blue LOAD button. Viola! the tape would run, and the operating system would be loaded. Just to clarify in a single sentence: some of these systems did not have disks. I think there was (& is) a strong implication of 'single-user' with the name DOS. Just to add to what already have been said here. You need to remember that until late '60s there were no disks of any kind used in computer storage or otherwise. All computing systems where using punch-cards or tapes for any data storage and input/output. They were nothing more than huge electronic devices with what you would call active memory setup, all actions where done in memory. When you start the "computer" it would run a set of instructions stored in the read only memory module EPROM/BIOS that would check all the hardware connected to the system and would wait for the user to start some kind of action. The action would be a command to load the program from a data medium. i.e. load a punch-card from a reader, or load a tape. Keep in mind that data storage medium progression where a board with a physical on/off switches ==> to a paper punch-card ==> to a paper punch tape ==> to magnetic tape similar to what been used in audio or video tapes. All of these storage mediums have one thing in common, they were/are a sequential read devices. You have to start and read all of it from beginning to end. And they way it would work is that you would first load the OS in the form of interpreter and compiler, then you would load the program which would be compiled and loaded into memory, then you wold load the data which would be processed by the program and the output would be dumped to printer, or, if further processing where needed, to the input medium like punch-card or tape to be loaded later. With the advancement of magnetic media, IBM in search of cheap, reliable, and portable storage media, developed the first floppy disk. Yet there were no operating system to properly use it. The disk was 8" in diameter, read only, and essentially was still used as a tape, until in 1974 Gary Kildall of Digital Research, Inc. Came up with CP/M (originally standing for Control Program/Monitor and later Control Program for Microcomputers) that initially where targeting an Intel 8080/85-based 8 bit microcomputers systems. The key point of the CP/M and why it was so successful at the time was that it introduced different use of the disk media i.e. a non sequential read and later write of the data to/from the media. It had small memory footprint (only 64Kb) it was fast and reliable. The CP/M system where a de facto standard for computing system that where using disk storage medium until 1981, when IBM ventured into Personal computing. They did initially approach Digital Research for license of CP/M to be used on IBM/PC but were not successful in that endeavor and went back to Microsoft which in turn came up with PC-DOS and later with MS-DOS. The Tatung Einstein was a mid-80s 8-bit home machine. When booted without a disk in the drive it would start a monitor interface (hex editor and debugger) called MOS - the Machine Operating System. This interface could then chainload DOS from the floppy drive. The DOS it used was a CP/M deriviative. In the mid to late 1960s Digital Equipment Corporation's 36-bit PDP6, and its successor the 36-bit PDP-10, had a DECtape-based operating system called the Monitor. It was a multi-green-screen timesharing system. DECtape was a highly-reliable magnetic tape system providing random access to numbered blocks of data. This was later superseded by a disk-based operating system, but prior to that in 1969 custom disk access for data storage was developed for the Melbourne Stock Exchange in Australia. As I recall, early desktop computers (what became known as PCs, as well as the first Macs) didn't have hard disks, only memory (ROM, RAM) and, later, removable floppies. The computer's BIOS (Basic Input/Output System) was the firmware that booted the computer. It had to be loaded first to get the computer up and running before any DOS could be used. Back in the day, we used a Data General Nova computer with a 9-track tape drive. It had non-volatile core memory. And when you use RTOS (The Real-Time Tape Operating System, the 9-track was used much like hard drives are used now. There was a directory at the beginning that would tell the tape unit where to find the files. We used it for scientific research, and stored both data and programs on the tapes. No disks on that system at that time. Not the answer you're looking for? Browse other questions tagged floppy-disk ms-dos rom operating-system apple-dos or ask your own question. What was the first operating system to feature a separate kernel? Was it Microsoft that started the war between Application and OS vendors? Are floppy disks used for MS-DOS setup still needed after you install the operating system? Can anyone help provide more information regarding an operating system called I/OS by Infosoft in the early 1980's?